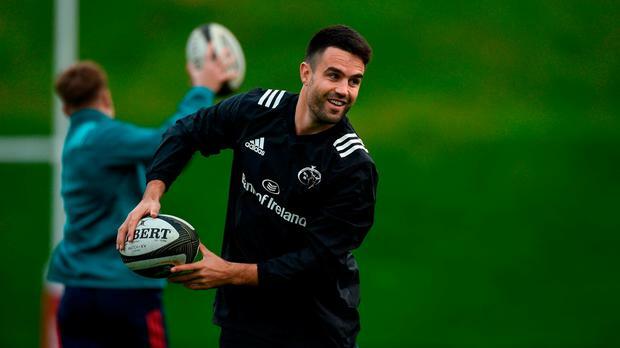 Conor Murray is in line to make his first appearance of the season after being named among the Munster replacements for the Pro14 with Zebre at Stadio Sergio Lanfranchi on Sunday (4.30pm local time, 3.30pm Irish time – live on eir Sport and Premier Sports). Murray last played during Ireland's summer tour to Australia and hasn't featured for Munster at all this season due to a neck injury, while Farrell has been recovering from a knee injury picked up in the Six Nations. Murray, Farrell Ronan O’Mahony makes his first appearance of the 2018/19 season. Tyler Bleyendaal continues his captaincy from inside centre and Academy player Gavin Coombes makes his first PRO14 start. Rory Scannell starts in the 13 shirt with Bleyendaal completing the centre partnership. Neil Cronin and JJ Hanrahan combine in the half-backs. The pack sees Jeremy Loughman, Kevin O’Byrne and Stephen Archer in the front row with Fineen Wycherley and Darren O’Shea partnering in the second row. Coombes is joined by Chris Cloete and Arno Botha in the back row. Academy player Sean O’Connor is named among the replacements. Munster: (15-9) Mike Haley; Ronan O’Mahony; Rory Scannell, Tyler Bleyendaal (C); Alex Wootton; JJ Hanrahan, Neil Cronin; (1-8) Jeremy Loughman, Kevin O’Byrne, Stephen Archer; Fineen Wycherley, Darren O’Shea; Gavin Coombes, Chris Cloete, Arno Botha. Replacements: (16-23) Mike Sherry, Brian Scott, Ciaran Parker, Sean O’Connor, Conor Oliver, Conor Murray, Bill Johnston, Chris Farrell.